Attention. Attention. I SAID ATTENTION! Thank you. 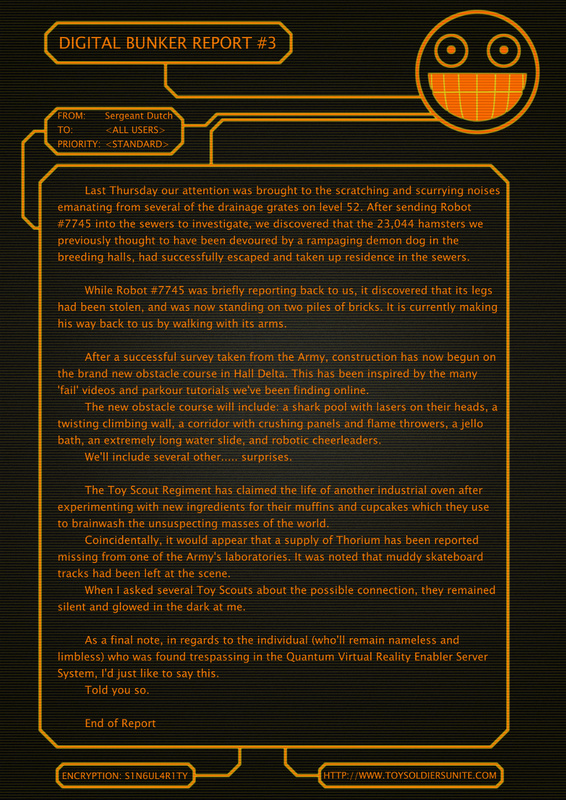 Your weekly Digital Bunker Report is now available on all terminal screens. Please call our customer service robots if you find that your terminal screen has gone terminal. Thank you. Previous Previous post: Toy Soldier Of The Week: Toy Soldier Timmy! Next Next post: Robot Attack – R.C. *best Mortal Combat voice* FIGHT! Oh well limbs ain’t that important are they? Of coarse they are Chief! Some/most of us would not be able to bulid and create without them and as a toysoldier you should be aware of that.